A few years ago, the American music press was gloriously abuzz about the triumphant return of the female pop singer-songwriter with brains, with the Grammy-nominated triumvirate of Michelle Branch, Avril Lavigne and Vanessa Carlton leading the charge. While the grouping of the three was at least a bit suspect, the idea that a woman could be a pop star without a ridiculously hypersexualized image or a repertoire of vapid ballads about how, like, broken hearts hurt and stuff had people talking about a sea change in the perceptions of women in popular media—something resembling an undoing of the Spears/Aguilera/Maxim Era of the late 90s and very early 00s. Alas, the so-called revolution was not meant to last as Branch went country, Carlton went Goth and Lavigne went on to supercelebrity. In the time since, the likes of KT Tunstall, Mindy Smith and Cat Power have worked to various degrees of success to capitalize on the headway regained in mainstream music, while alt-country and power pop heroines Neko Case and Jenny Lewis remain perpetually stuck atop the indie rock heap but just beneath the popular radar. More recently, beehive diva-turned-tabloid regular Amy Winehouse became both a critical darling and runaway commercial success just long enough to finish the first two acts of every great rock documentary (Part III: The Triumphant Return of Wino coming soon!). 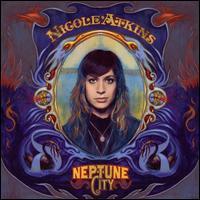 So in the wake of all that, which should theoretically and ideally have nothing to do with her excellent album Neptune City, comes psych-folk-oldies rocker/revivalist Nicole Atkins. Borrowing heavily and judiciously from nearly every school of rock that came before her, Atkins’ debut sounds remarkably fresh considering just how much of it sounds like postcards from late-night radio of thirty, forty, even fifty years ago. Through the slight Marc Bolan-esque vocal warbles and big-beat-meets-surf-rock arrangements of backing band The Sea, the doo-wop harmonies and the big-screen romanticism strangely reminiscent of that other singer-songwriter who made Asbury Park famous, Atkins and company fill the forty minutes of Neptune City with the sound of old souls sharing hard-fought wisdom. Neptune City isn’t an album without fault, but its strengths make those flaws very, very easy to overlook. Sure, the lyrics may be a bit clumsy at points, and some of the melodies might sound just slightly labored. Polished to perfection by Tore Johansson’s meticulous production, the songs still somehow shine where others would simply burn up in their own missteps. Then again, it was an expertly-crafted, Swedish-produced album which indirectly led Spears to her almost unprecedented public downward spiral, and the slightly imperfect throwback debut album didn’t exactly pan out as the Smiths and Carltons of the early part of the decade might have hoped. Only time will tell what’s in store for Atkins, but Neptune City suggests her future’s a bright one.